This 'Knowledge Base' is by no means meant to be the definitive work on Trumpet / Aurelian hybrid lilies as it only scratches the surface on these magnificent garden subjects. It is put together to help save the historical information we have in photos. This will be a continuing work as others around the world contribute photos, especially of the earliest works in hybridizing in the 1920's through the late 1940's. Bear in mid that the photos of the earliest lilies came from film or slides (some preserved on glass) that are upwards of 95 years old and color over time has grown weak in some. It is with a great deal of thanks to the daughter of the late William (Bill) and Mary Hoffman who gave to us her parents life long collection of slides, photographs, and negative film of our earliest examples of Trumpets and Aurelians. Many of these photos, taken by Bill and Mary are being seen for the first time by the garden world highlighting the work of Carlton Yerex, known as �the father� of the magnificent Aurelian Hybrids as well as Mr. Edgar Kline who, without his work, we would still be living in the dark ages as far as these hybrids go. They, along with our dear friend, LeVern Friemann broke the ground and allowed others to follow in their footsteps. Stately trumpet lilies, gently swaying in midsummer breezes, bring fond memories to many people of the bygone days of the the old 'Oregon Bulb Farms' and its originator, the late Mr. Jan de Graaff. In the 1950's and 60's, OBF released such popular beauties as 'Pink Perfection, 'Copper king', and 'Moonlight', not to mention the world renowned 'Black Dragon'. A little known fact is that the original hybridizing breakthrough on some of these cultivars was developed by the late Mr. LeVern Friemann of Bellingham, Washington which he had sold �lock, stock, and barrel� to Mr. de Graaff several years before the release of the earliest fragrant trumpet hybrids. Carlton Yerex and Edgar Kline, both of Oregon, also made immeasurable contributions to the early works of Mr. de Graaff. Their genetic contributions along with those of others were combined into and formed much of the basis of the material Mr. Harold Comber used in the 50's and 60's while head hybridizer of OBF. From there, Mr. Edward McRae picked up the torch and carried it ever forward. It was not simply the work of a single individual that gave the world their first taste of Trumpets, but the co-operation of many individuals pooling their work in order to advance this magnificent group of lilies. Trumpets are easiest to grow in areas of moderate winter temperatures, USDA zone 7-10; in colder areas with reliable snow cover, or where the garden is mulched after the ground freezes in the fall. Trumpets for the most part are slow to divide, but just keep getting larger and larger, with taller and taller stems as they age. 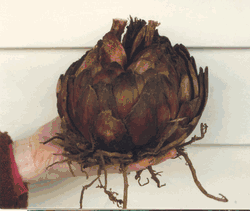 Shown in the photo is a bulb that measured 19 � inches in circumference. Planted 3 years early as a 6 inch bulb, it had produced two stems just over 7 feet in height and its flowers were pressed against the eves of the house. Photo courtesy of Ethel O'Brien. Trumpets in this section are identified as being either �Strains� or �Clones� A strain is a selection of plants, that are produced from seed. In a strain there will be some differences from plant to plant (lighter to darker colors) but all will be in the same color group. Most strains are fairly uniform in height, but can vary by 30% or more from one to another in the extremes. Clones are genetic duplicates, each bulb blooming exactly like the original parent bulb. They are propagated either by scaling or through tissue culture. Please Note: This has been a years long project just pulling together photos and scanning them. Our intent is to first upload all of the photos with a brief sketch of information to date and describe them in terms of their breeding. After the uploads are completed, more detailed information will be added about each cultivar. Our grateful thanks to Michael Homick for his 1996 publication of registered lilies without which the parentage records given would have been impossible. These lilies are not being offered for sale, this work is for reference only, most of the lilies shown have been lost to cultivation.